How important is pedestrian traffic to a business? A recent New York Times article [Hamptons Hope for an End to the Seasonal Store] speaks to the challenges facing businesses in the wealthy communities known as ‘The Hamptons’ on Long Island – a place overrun in the summers with wealthy visitors renting or visiting their vacation homes. While not every community compares to the Hamptons, the article discusses the factors that affect where people walk and how late they stroll, and ultimately underscores the importance of foot traffic in meeting sales figures and setting leasehold rates. Any reader familiar with urban planning theory will also note that none of this is new, just new examples that are playing themselves out in real time. 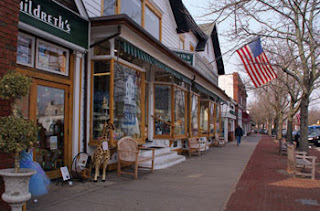 District’s benefit from an entertainment anchor that drives retail traffic: In East Hampton, “stores benefit from having a movie theatre in the center of Main Street’s business district”. On the other hand, in Southhampton, “the movie theater is on the edge of town”. The difference in what landlords can charge in rent is ultimately based on what retailers can expect to sell, and higher foot traffic means higher sales. So in East Hampton, rents range from $110 – 140 per square foot, but in South Hampton, they are closer to $70-75 per square foot. A significant difference for any retailer, but of course the assumption is that more foot traffic brings higher sales – so the business can support a higher rental rate. Sidewalk dining activates the street and attracts more people. Another point made was the fact that Southhampton rejuvenated “its commercial strip by allowing restaurant owners to put tables on the sidewalks, keeping the town lively even after sunset.” Activity breeds activity, and the act of enlivening the sidewalk draws even more foot traffic. A colleague of mine runs a small Business Improvement District in one of New York’s highest density tourist districts – but he has found that visitors do not often walk through his district, despite the fact that they walk past it. Why aren’t they turning the corner to walk down his street? Part of the problem is that when they look down the street, they don’t get a sense that it is worth their while. They can’t see signs for many of the businesses – the signs lay flat against the building rather than protruding out (these vertical signs are known as “blade signs”). He is also working with City Planning to allow for sidewalk cafes that will activate the street, much as Southhampton has done successfully. Is 100 yards is too far to walk? One business owner in the article mentions that they moved their store location 100 yards, and noticed a considerable drop in foot traffic. He says “it’s only 100 yards, but it’s literately night and day for us.” Take a micro-look at your district. Does your retail change from block to block? Is there a significant drop in pedestrian traffic from one street to the next? As you think through your retail environment, keep in mind that the micro-dynamics of your district will play a major role in the success or failure of your neighborhood businesses. Helping businesses buy their properties helps buffer smaller businesses from rent increases, particularly in ‘hot’ neighborhoods. As an owner in Bridgehampton notes, he would have been unable to afford the rents if he had not bought his building when he opened the business in 1982. Helping businesses buy their properties is an excellent way to ensure they are able to withstand the real estate pressures associates with neighborhood improvement. An in the event that they choose to close their stores, they have built equity overtime – a win-win for all. While I haven't fully developed the concept (hey, maybe we could do some joint consulting? ), I have laid out a framework for daypart-based planning of retail and attractions in a commercial district, as explicated in a CD Revitalization Framework Plan I did for Cambridge, MD. (Starting at p. 15). Magnificent point about BUYING YOUR OWN PROPERTY. Yet is really is a SILVER BULLET.